Prices start at $250(plus travel fee from Brooklyn) for a 60 minute party. Bubbledad is based in Park Slope, Brooklyn. Travel fees apply to all events 5 miles from Bubbledad HQ. Pricing varies depending on the size of the event, day and time and location. Please contact directly for details. 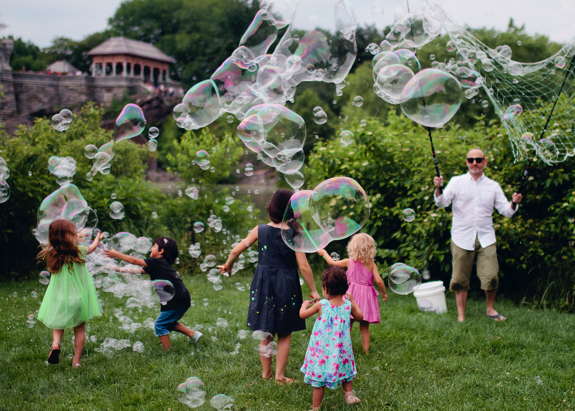 Bubbledad is also available for weddings, school, museums, camp programs and festivals. Bubbledad and his team of bubble performers bring an unbridled passion for bubbles to every performance. 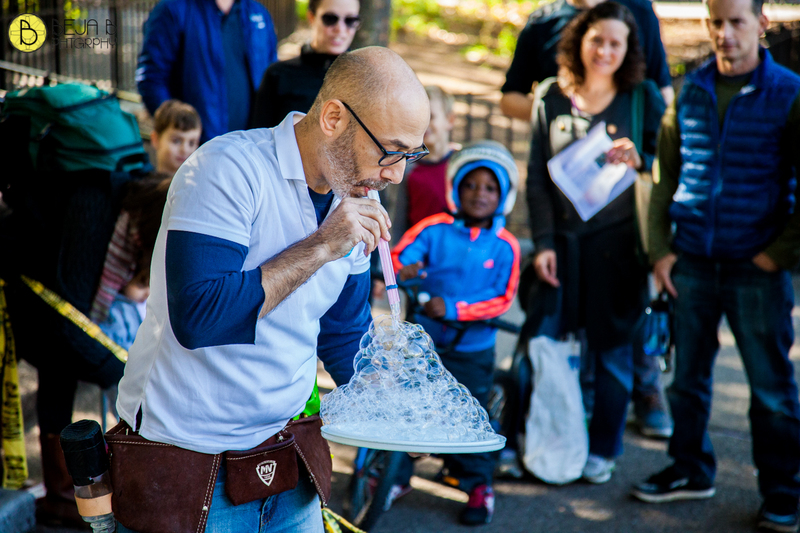 Whether it’s a science show, a birthday party, a wedding, a corporate event, or a street fair–bubbles make any event WAY more fun! Outdoor events begin with about 30 minutes of a fun, interactive bubble show with jokes and all kinds of bubbles (square bubbles, a rubber chicken bubble and even a Hello Kitty bubble!) Next, the air is filled with thousands of big, huge, GINORMOUS bubbles for the kids to run around and pop! Indoor parties are more like a fun, interactive, sciency magic show with bubbles. There are square bubbles, smoke bubbles, a bubble carousel, a bubble cake, a bubble hat, a bubble caterpillar, and bubbles that float straight up to the ceiling. And then we finish by putting each kid INSIDE a bubble! It’s pretty intense. And magical. 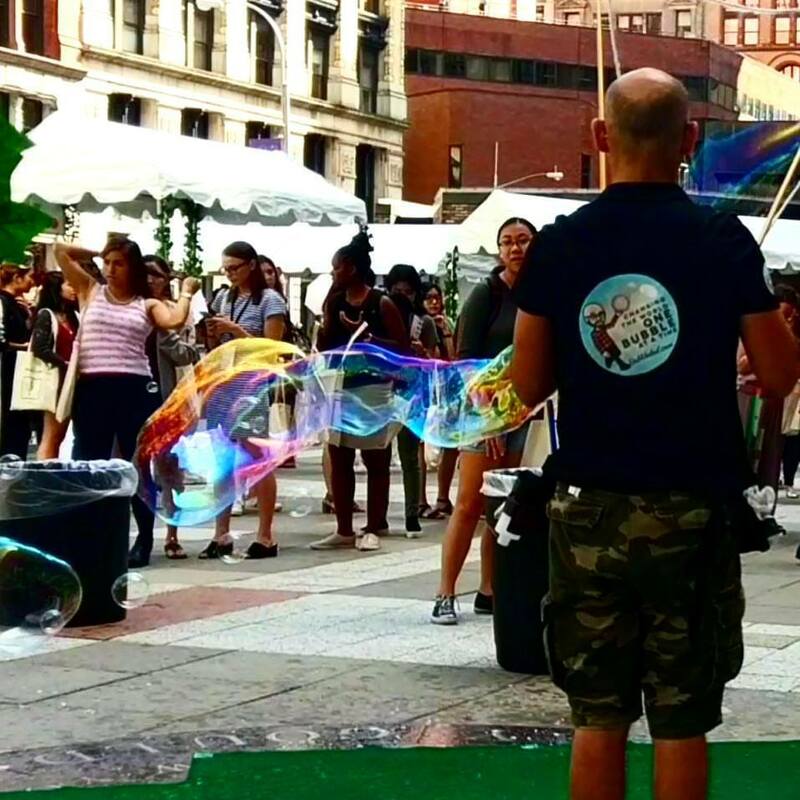 Let Bubbledad bring some of that magic to your next event. Whether its a science show, a birthday party, a wedding, a corporate event, or a festival, Bubbledad puts his heart into every bubble. 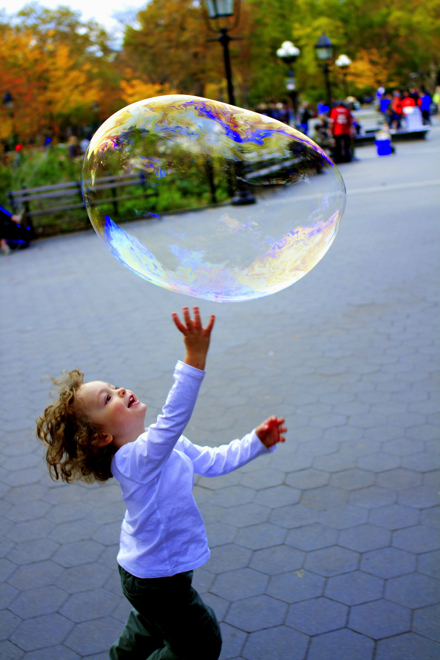 Kids won’t get to blow & pop bubbles, but they can be put INSIDE a bubble! Bubble activity is contained in a compact area. Not dependent on weather conditions. OUTDOOR PARTIES aka BUBBLE MAYHEM! Kids will get to pop thousands of bubbles! Subject to weather conditions. Overcast/drizzly is fine, but high wind and heavy rains aren’t good for bubbles. HYBRID INSIDE/OUTSIDE aka SCIENCE-Y MAYHEM! Time can be an issue to include all elements.